Masopust technically refers to the period between the arrival of the Three Kings during Christmas festivities and Ash Wednesday and there are numerous traditions associated with Masopust in the Czech Republic. From parades to pig slaughters, during the last weeks approaching Lent a variety of events take place across the country to mark the occasion. In Prague, Masopust celebrations involve masked parades, music, feasting and drinking, and these events span across the city. It is the neighbourhood of Žižkov, however, that is heralded as hosting the oldest Masopust festivities in Prague, with its parade and celebrations taking place in Náměstí Jiřího z Poděbrad for over a quarter of a century. Float of T.G. Masaryk at recent Masopust celebrations in Prague. Photo: Molly Fergus. This year, events took place over the weekend of the 2nd and 3rd of March, including a market, musical performances, workshops and traditional feasts and the celebration reached its pinnacle at the famous carnival parade that took place from Náměstí Jiriho z Podebrad on Tuesday the 5th of March. Beginning at Náměstí Jiřího z Poděbrad, a concession of floats, musicians and masked actors wove through the heart of Žižkov, carrying spectators in its masses to ceremonially request the key to Žižkov from the Town Hall. There, another musical performance and fire breathers entertained the masses as the sun went down, and carried on to Viktoria Žižkov stadium. The parade then returned to Náměstí Jiřího z Poděbrad, where a fireshow and prize giving marked the completion of the parade for yet another year. The vibrant array of colours, noises and motion carried down the streets of the neighbourhood by the teams of costumed participants singing and dancing stood in contrast to overast setting provided by the early March weather. Spectators, many clad in masked and costumes, were themselves intertwined with the parade itself, highlighting the interactive and community focused theme of the event. 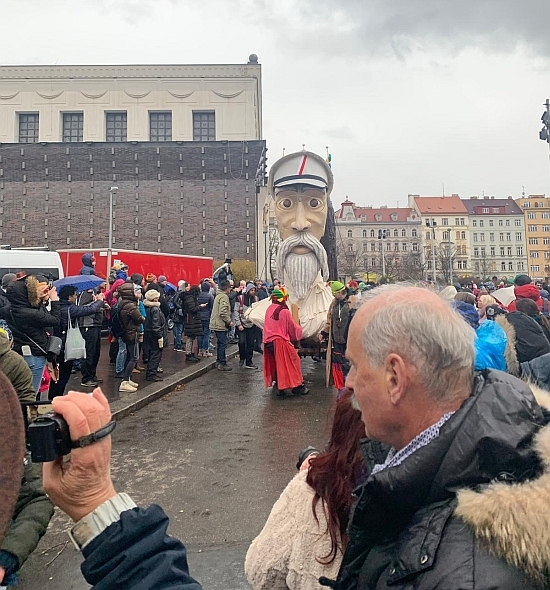 Attracting tourists and locals alike, it was the first time for some to experience the Žižkov Masopust festivities, while for others the carnival is already a well loved tradition. Masopust in Prague, 2019. Photo: Molly Fergus. “We have been attending Masopust here in Žižkov for years with our children, “ one spectator stated, “we enjoy the unique nature of these events”. For many, the celebration of Masopust has lost its religious connotations, seen more for its festive nature than as a marker for the beginning of the sombre Lenten period, and the celebration can have different offerings to its village counterparts. “In the villages Masopust can be much more crazy”, another attendee of the Žižkov parade commented, “here it is more about the costumes”. 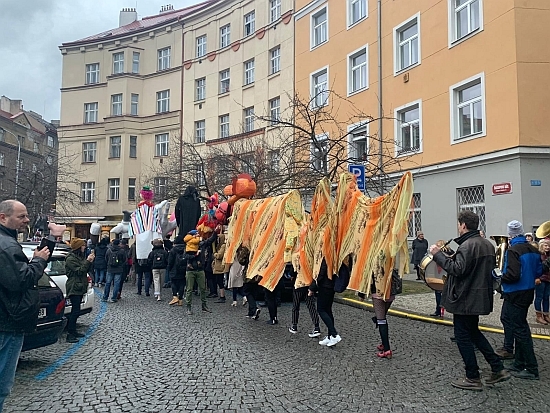 Within Charles University itself, this year marked the first celebration of the "Geografický masopust", or geographical carnival held on the 7th of March within the faculty of Science in Albertov. Led by geography students from the university, the event included quizzes, mask wearing and the traditional festive activities of eating and drinking that have become closely associated with Masopust celebrations throughout the years. Photo on main page: Shutterstock.